Yeah, but: Everything's bigger in New York. The Long Version: I've always wanted to be able to say: "Well, when I saw this show in New York, ____________" and now I finally can. Almost. 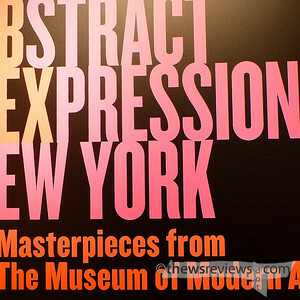 While they're both called Abstract Expressionist New York, the AGO exhibit has the tagline "Masterpieces from the Museum of Modern Art". That's a subtle but important difference between the Art Gallery of Ontario and the MoMA show, from which the AGO takes all of its multimedia. I'll return to that at the end of this review. 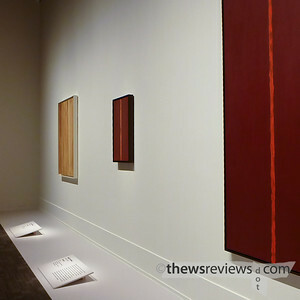 The AGO's AbExNY show is nicely put together, with large information cards at the base of each painting. These can be read from anywhere in front of the art, and provide information about the artist and perhaps a bit about their work. This is a vast improvement over the little 5x7" cards on the wall that need people to come right up to read them, and must be a huge part of why the AGO's guards were so relaxed. Now I wonder why it hasn't always been done that way. The larger rooms have carpeting with a metre-wide hard border on their perimeter, which is a nice way of enforcing a respectful distance. Smaller rooms with wooden floors have the traditional calf-high rope barrier to identify the art – a cue that's often appreciated for modern works – and ensure that it remains unperturbed. Photographing any art is explicitly prohibited by the AGO, but I didn't see that ban enforced in any of the many times that I saw it being broken. The two biggest stars of abstract expressionism must be Jackson Pollock and Mark Rothko. 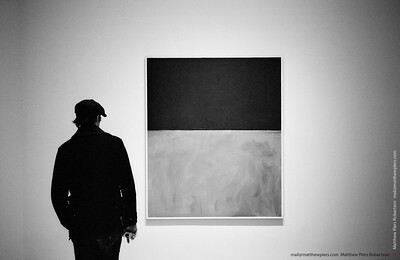 Rothko is represented by two of his surrealist works, three of his brighter paintings, and three from his darker period. The lighting in his room was nicely done, with a lower ambient level that let the colourful paintings be brightly lit while the more somber ones were allowed to be darker. It was both sensitive and suitable. It's just a pity that the seating in the centre of the room is too uncomfortable to spend quality time on. Given Rothko's appeal – his was by far the most crowded room, both in Toronto and New York – and the scale of his work, it makes sense that these are among the largest canvases in the show. 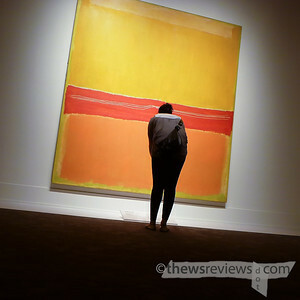 It was Rothko's work that first caught my interest and introduced me to colour field art, and it is worth the price of admission just to see these six paintings. The other headliner of the collection, Jackson Pollock, is likewise given a room to himself – his wife is left to wait outside – and is also represented by a good range of work. My tastes have always run toward minimalism, so Pollock's not a good fit for me, but this is still a room that's worth spending a lot of time in. The seats here are considerably more comfortable than those in the Rothko display. The AGO's AbEx exhibit spans from the late 1940's to the end of the 1960's, and while the headliners of Rothko and Pollock are clearly the stars of the show, there's a sampling of other works from their contemporaries as well. Some of these stray into surrealism or recognizable subjects, but for the most part the focus is confined to a slice of time and geography that won't disappoint anyone looking for the popular abstract expressionist art. If this sounds like you, and you're within striking distance of Dundas and McCaul, it's worth spending an hour or two at the AGO. And really, that concludes my review of AbEx:AGO, and writing it has stressed my knowledge of art far too much already. If what I've already written sounds good, you will like the AGO's Abstract Expressionist show. It's the reason why I bought an AGO membership, and have gone to see the collection three times in its first two weeks. I've been quite happy with the AGO's accomplishment of having the art moved to Toronto for the summer, but that's not quite my only reaction. What follows is merely a wildly impractical and personal reaction, unfounded supposition, and general nonsense. 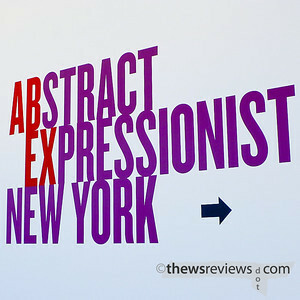 When I saw the Abstract Expressionist show in New York, it was huge. An entire floor of MoMA had been devoted to it, where the art spanned a wider range and went into a greater depth. On my first visit to the AGO's AbEx show I found myself looking for the rest of it. ("Nope, that's the gift shop.") The AGO exhibit, as exceptional as it is, is clearly a travelling show. I can't help but feel that display space, transportation, and insurance value all played a huge part in the art selection process. 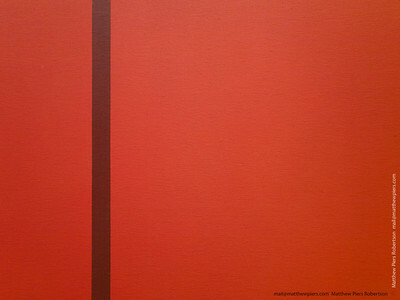 The exhibition in New York gave Barnett Newman a room to himself that was dominated by massive canvasses, while the AGO has only a few of his smaller and narrower paintings. As good as Abraham is, it's no substitute for Vir Heroicus Sublimis. In Toronto Jackson Pollock is also represented by mostly smaller canvases that simply don't convey the same impression as the bigger paintings carry in their home city. Perhaps perversely, I found myself disappointed that one of Rothko's smaller peices from MoMA's display – an untitled work in grey and black, with a white border – didn't make the trip. Some people are just never satisfied. Likewise Cy Twombly and Jasper Johns are nowhere to be found, and while I recognize that Johns mostly lies outside of the scope of abstract expressionism, his gesture paintings were included in New York and would have been a great challenge to the Pollock/Rothko pairing. At the same time, the AGO has devoted two large walls to small framed photographs from Aaron Siskind, Harry Callahan, and others. While these are worth seeing, they're not why anyone is coming to Abstract Expressionist New York. On the positive side, they're framed with such reflective glass that looking at the photos is a great way to see the rest of the show. 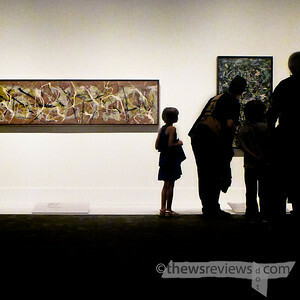 While it may seem churlish of me to compare an exhibition drawn from MoMA's vast collection to the display that they sent to another nation, the AGO invites the comparison by using the multimedia from the MoMA exhibit. Have a look at those videos for a glimpse of the scope and depth that was offered in New York – the "Masterpieces from the Museum of Modern Art" isn't quite the same. I'm thrilled to have such a great collection so close to home, even if it's only for the summer, but doesn't replace a trip to New York and its many exceptional galleries. My advice: do both.